People protested on Friday in different areas of Bahrain in response to the arrest of Sheikh Ali Salman, head of al-Wefaq Shia bloc. The agents of Al Khalifa regime using force and poisonous gas dispersed protesters. 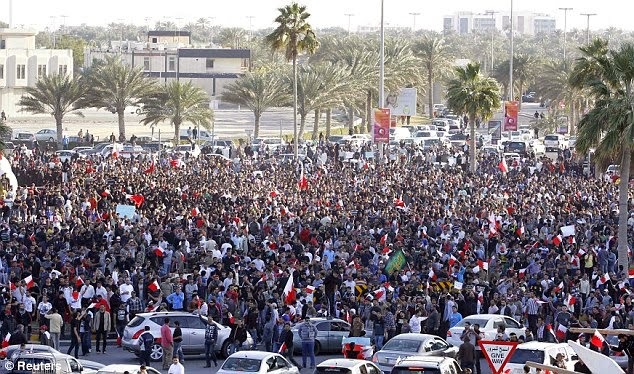 The interior ministry of Bahrain warned protesters not to rally on Al-Badi street on Friday. Peaceful protest by individuals in different areas of Bahrain now is in its seventh day. The protest as always turns violent by the attack from the agents of Al Khalifa regime. The security forces of Al Khalifa arrested Sheikh Ali Salman, head of al-Wefaq Shia bloc, last week. The attorney general of Al Khalifa regime has extended the period this known figure must spend in custody by false and imaginative allegations.